Comments, questions, or suggestions? Email Kristin McCarthy at kmccarthy@fmep.org. To subscribe to this report, please click here. On August 22nd, the Israeli Defense Ministry’s High Planning Council (the body in the Israeli Defense Ministry responsible for regulating all construction in the West Bank) advanced plans for 1,004 new settlement units, 96% of which are located deep inside of the West Bank. Of the total, 620 units were approved for deposit for public review and 382 units were given final approval for construction. 370 units in the Adam settlement (aka Geva Benyamin). This project was urged on by Defense Minister Liberman following a stabbing attack in the settlement, which resulted in one death and injuries to three others. The 370 units are part of a larger plan for 1,000+ units that will, if built, connect the Adam settlement to two large settlements in East Jerusalem (Neve Ya’akov and Pisgat Ze’ev) that are on the Israeli side of the separation barrier (the route of the barrier juts far beyond the 1967 Green Line to include Pisgat Ze’ev and Neve Ya’akov on the Israeli side while the Adam settlement is on the West Bank side). If the larger plan is implemented, the Adam settlement will have built up areas on both sides of the separation barrier, which could (in all likelihood) present Israel an opportunity to re-route the barrier around Adam — which would de facto annex even more West Bank land to Israel and further choke off Palestinian East Jerusalem from the West Bank to its north. [Note: FMEP’s Lara Friedman and Peace Now’s Hagit Ofran published an op-ed in Haaretz in 2008 warning of this plan – you can read that background here]. 84 units in the Kiryat Netafim settlement, located about half way between the Ariel settlement and the cluster of settlements close to the 1967 Green Line that are slated to be united into a “super settlement” area (Oranit, Elkana, Shiva Tikva, and others). The expansion of Kiryat Netafim will go towards creating a contiguous corridor of Israeli settlements stretching from sovereign Israeli territory, though the super settlement, to Ariel. As FMEP has repeatedly said, the Ariel settlement is located in the heart of the northern West Bank, reaching literally to the midpoint between the Green Line and the Jordan border. 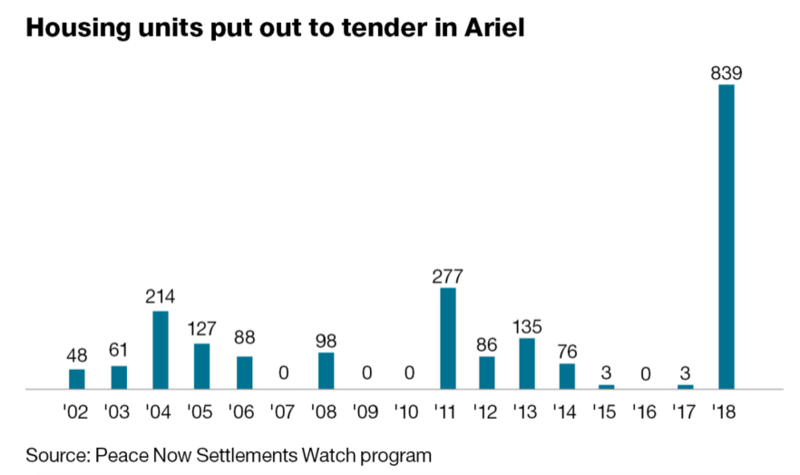 The future of Ariel has long been one of the greatest challenges to any possible peace agreement, since any plan to attach Ariel to Israel (with a finger of land running through settlements like Kiryat Netafim) will cut the northern West Bank into pieces. 52 units in the Beit El settlement. This is the second major approval for new units in Beit El in 2018, with a third plan for 300 more units coming soon, according to Israel Hayom. The construction boom is being hailed by the settler-aligned Arutz Sheva outlet, which wrote that the plans will increase the size of Beit El by 65%. If any of the units are constructed it will be first new, government-sanctioned construction in Beit El in over 10 years. U.S. Ambassador to Israel David Friedman is closely associated with the Beit El settlement, having donated to and fundraised for it prior to his appointment as ambassador (including in his capacity as the President of the American Friends of Beit El, reportedly from 2011 until he became ambassador). 29 units in the Otinel settlement, located south of Hebron. MK Yehuda Glick (Likud) lives in Otinel. 168 units in the Tzofim settlement, located on the Israeli side of the separation barrier, but jutting towards the Karnei Shomron settlement, which also received advancements this week. See the section on Karnei Shomron, above, for context and news regarding this area of settlements. 108 units in the Nofim settlement, located on the Israeli side of the separation barrier but jutting towards the Karnei Shomron settlement, which also received advancements this week. See the section on Karnei Shomron, above, for context and news regarding this area of settlements. 56 units in the Barkan settlement, located near the Kiryat Netafim settlement. Both Barkan and Netafim are located about half way between the Ariel settlement and the cluster of settlements slated to be united into a “super settlement” area (Oranit, Elkana, Shiva Tikva, and others). See the section on Kiryat Netafim, above. for context and news regarding this area of settlements. 44 units in Ma’ale Adumim, the mega settlement just east of Jerusalem. 6 units in the Avnei Hefetz settlement, located southeast of the Palestinian city of Tulkarem. A plan to retroactively legalize the Ibei Hanahel outpost, which is a non-contiguous “neighborhood” of the Ma’ale Amos settlement, located deep in the southern West Bank. The plan would have allowed the outpost to be demolished and then rebuilt legally with residential units, transforming the outpost into a new, fully authorized settlement. A plan to build an education center in the Nofei Prat South outpost, which is a non-contiguous“neighborhood” of the Kfar Adumim settlement, located northeast of Jerusalem. The land on which the project would be built is located just 1.5 km away from the Khan Al-Ahmar Bedouin community – the same one that the Israeli government plans to forcibly evacuate in order to cleanse the area of Palestinians and expand settlements. The outpost was established by the Haroeh Ha’ivri (“the Hebrew Shepherd”) nonprofit association, which is funded by the Israeli Education Ministry. On August 23rd, one day after the Defense Ministry’s High Planning Council advanced a huge tranche of settlement plans (detailed above), the Israeli Housing Ministry published tenders for a total of 425 settlement units (under plans previously approved by the High Planning Council). 211 units in the Ma’ale Efraim settlement, located in the Jordan Valley. 54 units in the Givat Ze’ev settlement, located north of Jerusalem. 52 units in the Beit Aryeh settlement, which comes in addition to the the publication of tenders for 511 units in the settlement last week. 42 units in the Ariel settlement. See reporting below for extensive coverage of the many reasons settlers in Ariel are celebrating this week. In addition to the tranche of settlement plans advanced by the Defense Ministry’s High Planning Council and the tenders published by the Housing Ministry (detailed above), the Jerusalem District Committee deposited for public review (one of the final steps before approval) plans for a total of 608 new settlement units in East Jerusalem, with 345 units slated for the Gilo settlement and 263 units in the Ramot settlement. As Ir Amim notes, this week’s advancements come on the heels of Israel’s August 15th decision to publish tenders for 603 units in Ramat Shlomo, and its June 2018 advancement of plans for 1,064 settlement units in the Pisgat Ze’ev settlement — bringing Israel’s two-month total of settlement advancements in East Jerusalem to 2,275 units. Ir Amim reports that on September 2nd, the Jerusalem District Committee is expected to discuss a plan to build a six-story building in Sheikh Jarrah, a neighborhood in which at least 75 families face eviction by radical settlers, with the backing of the Israeli government and courts. For detailed reporting on the building, plans for which were deposited for public review in May 2018, see FMEP reporting here. Peace Now reports that tenders are expected to be issued (having already been marketed) for more units in the Adam (Geva Binyamin) settlement. If true, this will be another step towards uniting Adam to the East Jerusalem settlements – the details of which are covered above. Peace Now also notes that a plan for 300 units in Beit El is expected to be advanced. This comes in addition to the 52 tenders issued for Beit El this week. 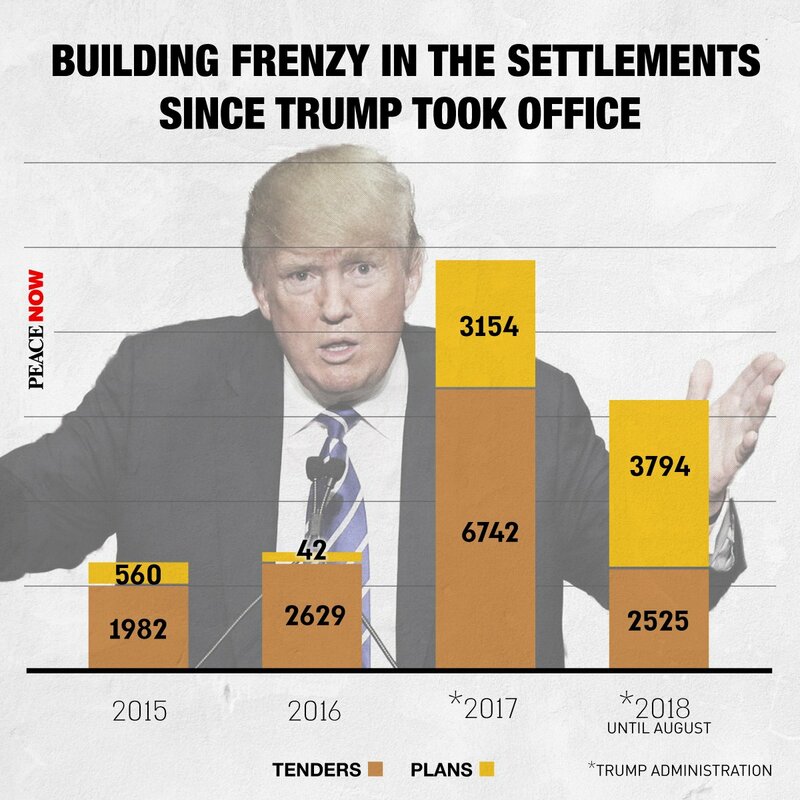 When asked for comment on the various major settlement announcements, the U.S. State Department said that the Trump Administration believes the Israeli government has clearly demonstrated an intent to “adopt a policy regarding settlement activity that takes the president’s concerns into consideration” – a statement that suggests unequivocally that the Trump Administration has given a green light for massive settlement expansion across the length and breadth of the West Bank and East Jerusalem. Notably, on the same day that the bulk of the settlement announcements were made, President Trump’s National Security Advisor, Ambassador John Bolton, was on the ground in Jerusalem. Not only did he offer no comment or criticism of the settlement announcements, he very publicly joined Israeli politicians and settlers leaders for dinner in East Jerusalem, dining in the “City of David National Park,” the archeological/touristic/residential site in the Palestinian neighborhood of Silwan that is run by the radical Elad settler organization. As FMEP has repeatedly covered, the Elad settler organization is spearheading a government-aided campaign to evict Palestinians from their homes in Silwan, replace them with Jewish Israeli settlers, and transform the neighborhood into a Biblical tourist site emphasizing exclusively the area’s Jewish history. On August 7th, the state’s private attorney Harel Arnon submitted a second brief [Hebrew] to the High Court of Justice in defense of the settlement “Regulation Law.” In it he argues that the Knesset is not bound by international law and has the right to apply its own laws outside of its borders and annex land, if it wishes. Harel was ordered to submit a second defense of the bill in response to a petition filed by Adalah and Al-Mezan on behalf of seventeen local Palestinian authorities. The petition argues that the Regulation Law violates international law and that the Knesset cannot enact laws over the West Bank where the majority of the population is Palestinians (who are not Israeli citizens and cannot vote). The High Court of Justice is widely expected to strike down the “Regulation Law,” but has yet to make a ruling. Just last week, Arnon made the case that the recently passed Nation-State Law, which makes “Jewish settlement,” a “constitutional value,” can help him defend the settlement law before the High Court. For ongoing tracking of the Regulation Law and other annexation trends in Israel, see FMEP’s Annexation Policy Tables. Not only has Ariel seen a massive surge in construction advancements this year, but the settlement broke ground on a new medical school heavily financed by U.S. casino magnate, and Trump backer, Sheldon Adelson (who this week gave $25 million to the GOP to help it keep the Senate, and in May gave the GOP $30 million to help it keep the House). Many settler leaders and Israeli officials, as well as Adelson and his wife Miriam, were in Ariel this weekend to attend a dedication ceremony for the medical school, despite ongoing controversy around its accreditation under domestic Israeli law. Prime Minister Netanyahu was notably absent from (and reportedly was not invited to) the ceremony, fueling rumors regarding the growing disaffection between him and Adelson. As FMEP has repeatedly documented, Ariel is located in the heart of the northern West Bank, reaching literally to the midpoint between the Green Line and the Jordan border. The future of Ariel has long been one of the greatest challenges to any possible peace agreement, since any plan to connect Ariel to Israel will cut the northern West Bank into pieces. The Ynet news outlet reports that the Amana settler organization – the official body of the settlement movement, operating since the 1970s – has moved into its new headquarters in the heart of the Sheikh Jarrah neighborhood of East Jerusalem, where settlers are continuing to wage a displacement campaign against Palestinian residents. Though Amana has owned the plot of land since 1992, various legal challenges and incredibly sensitive geopolitical considerations have slowed construction of the building, called the “Amana House” (see a detailed history here). 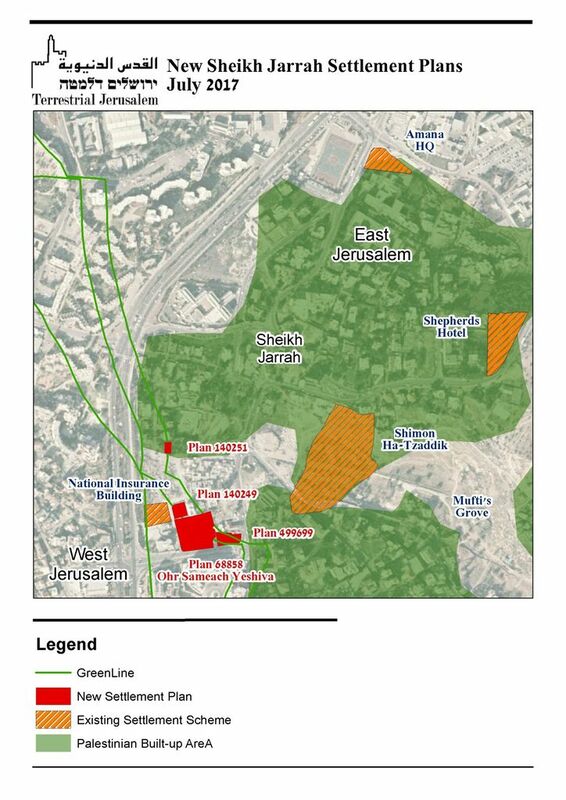 Several settlement plans are currently proceeding in Sheikh Jarrah, underscoring the strategic location and goals of settler activity in Sheikh Jarrah. As covered previously in this report, Israel is expected to advance a plan for a 6-story office building for settlers, located at the entrance to the neighborhood. Across the street from that building, a highly consequential plan for a new religious school (the Glassman yeshiva) was approved for deposit for public review in July 2017. The goal is clear: to unite the enclaves of settlers living inside of the Palestinian neighborhood by creating a contiguous area of settlement that connects to West Jerusalem, thereby cementing an immovable Jewish Israeli presence in a key Palestinian neighborhood – closing off the possibility of evacuation under a future peace deal.